HomeBlogNews2019Career Theories and Models at Work: Ideas for Practice – Now available! 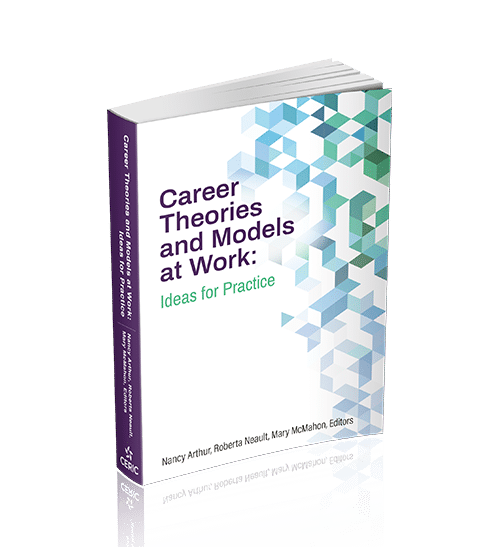 Expected to inform the practice of career development professionals around the globe, CERIC’s new Career Theories and Models at Work book is launching today at the Cannexus conference and available for purchase online now. This international collection, edited by Nancy Arthur (University of Calgary), Roberta Neault (Life Strategies) and Mary McMahon (University of Queensland) features contemporary and emerging career development theories and models from 60 leading researchers and career practitioners. The publication will provide practitioners with a tangible resource they can use to develop theory-informed interventions. It is also intended to be used as a text for career counselling courses. The publication is available for sale via Amazon.ca (as well as its international sites) and Chapters.Indigo.ca in print ($59.95) and in ebook ($34.50) format. Bulk copies (10 or more) can be purchased at 30% off by contacting sales@ceric.ca. The book has received advanced praise from Canada and around the world. Career Theories and Models at Work: Ideas for Practice is one of the most comprehensive textbooks to guide career development professionals. Drawing from a truly global list of authors, this text provides insights into the evolution and diversity of the field. Chapters cover a full range of topics, from children to athletes to organizational career practice. The highlight of each chapter is the practical tips provided which help bridge the models with the everyday needs of our work. Career development educators seeking a comprehensive, easy-to-understand text with illuminating case studies will want this publication on their students’ reading lists. Researchers across country contexts and disciplines will undoubtedly cite this work as background to their own contributions to the field. Those who advise and make career-related policy would do well to familiarize themselves with this valuable up-to-date guide to the theory and practice underpinning our profession. Career Theories and Models at Work will launch today at the Cannexus19 National Career Development Conference in Ottawa where attendees will each receive a complimentary copy. Mary McMahon will be delivering a keynote during the conference on Systems Theory and a panel of the book’s editors and authors will present a Mega session. Publishing of this book was made possible in part by the generous contributions of our Knowledge Champions, CLSR, Wilfrid Laurier University and Douglas College. View the table of contents, read other reviews and learn more at ceric.ca/theories.